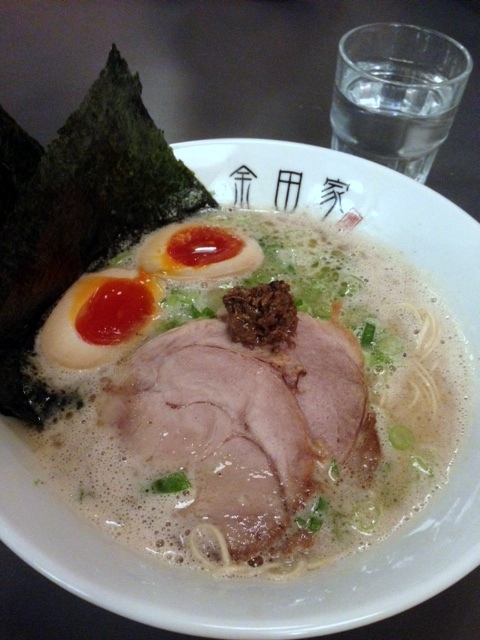 In December 2015 the well-known ramen bar Kanada-Ya on Giles Street opened a second, bigger branch on Panton Street near Trafalgar Square, offering the same selection of authentic tonkotsu ramen made famous by the Holborn flagship restaurant. The noodles are made on site using a special machine imported from Japan and many of the tonkotsu broths have been slow cooked for 18 hours for an authentic intense flavour. Along with the tonkotsu ramen noodles, Kanada-Ya Panton Street has introduced several new dishes such as chicken karaage and Japanese spicy kale. There is also a reasonable drinks menu including bottled cocktails, Japanese beers, wines and some rare Japanese Whiskeys. Moreover, Kanada-Ya Panton Street offers reservations on a limited basis. Therefore no more queuing!! 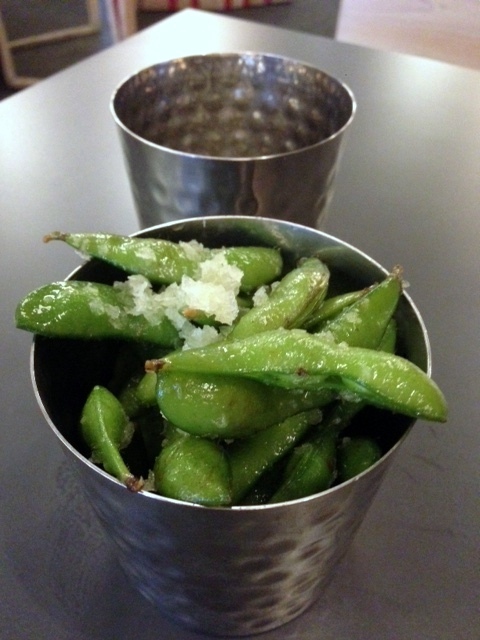 We tried some truffle edamame (£4) with black truffle salt. The edamame was a little oily, but overall they were pretty tasty with a fresh firmness to them, helped in no small part by the deliciousness of the truffle aroma. Karaage (£6.50), pieces of Japanese fried chicken were nicely cooked. They were crunchy on the outside and moist on the inside. They were good, but could have done with some extra seasoning. Accompanying the chicken was a delicious homemade mayonnaise. 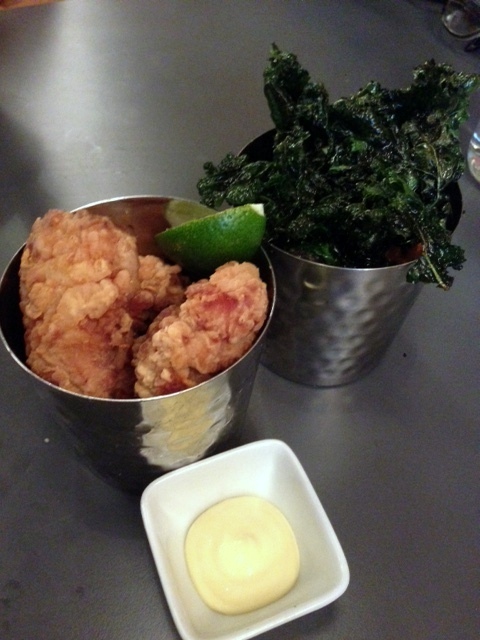 Also fried was Paolo’s deep-fried kale (£3). These were crispy, but also very oily. They were so oily they were rather unpalatable. 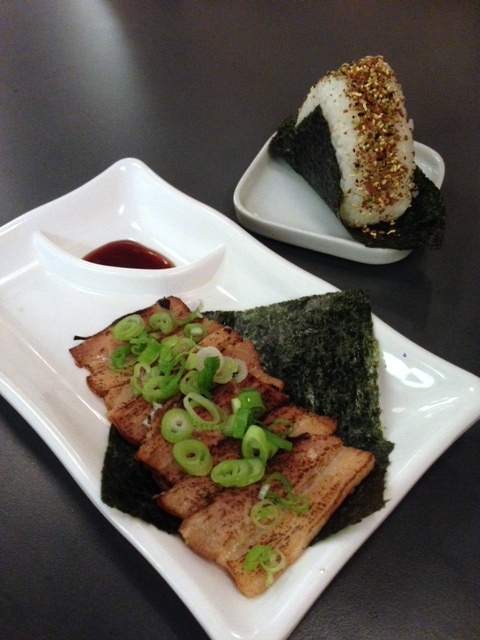 I found the ‘aburi chashu’ (£3), seared chashu pork belly with yakiniku tare to be a bit bland. But particularly delicious was the ‘sake’ (fresh flaked salmon) onigiri (1 pc – £3). The rice was moist and nicely seasoned, and the sweetness of the salmon contrasted well with the sea flavour of the seaweed. Moving onto the noodles, and I adored the 18-hour pork bone broth in the truffle ramen (£14) as it was creamy and intense with flavour. I had the ramen ‘hard’ – the recommended cooking level – and I thought this was the perfect way to eat the noodles as it had a nice ‘al dente’ bite to them. Accompanying the ramen was a chashu pork collar which was pleasant but a little cold, spring onions, and an aromatic porcini truffle paste. I also ordered some extra toppings for the ramen, a chashu-cured burford brown hanjuku egg (£2) which was tasty and perfectly runny, and some gold label nori (seaweed) (£1). To desserts and we tried two difference flavours of the soft serve ice cream (£4), one being green tea and the other being sesame. The green tea was slightly too bitter, but the sesame was wonderful. It had an aromatic, sweet flavour and was very satisfying. One of the things that I love about Kanada-Ya Giles Street is the intoxicating aroma of noodles and broth that draws you in ever time you walk past the restaurant. The queues are annoying, but there is something warming and cozy about the intimate little space. Like its older sister, the ramen noodles at Kanada-Ya Panton Street continue to be enjoyable, particularly the stellar tonkotsu 18-hour pork broth. But it doesn’t quite offer the same warmth and coziness of her sibling. What’s more some of the side dishes at Panton Street could have been better executed. It does have its own set of plus points, benefiting from a reservations policy and a larger seating capacity. That said, I still prefer Giles Street more. 1) The tonkotsu broth and well made ramen noodles. 2) The sesame soft service ice cream. 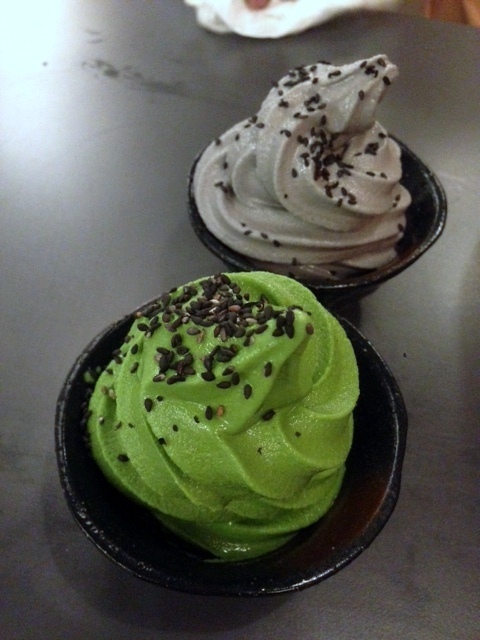 2) The green tea soft service ice cream. Average Price: About £20 a head, excludes drinks and service.